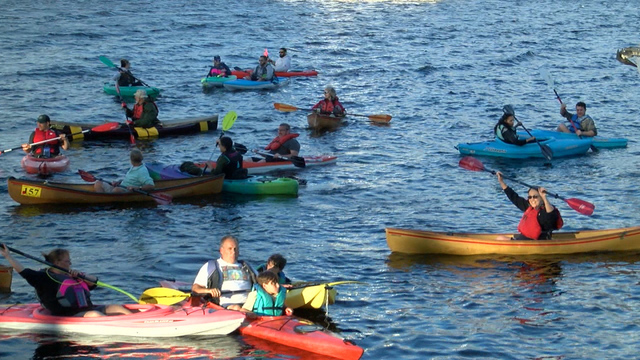 This year, Sunrise Rotary was excited to introduce a new event, the Great Champlain Kayak Chain - that took place on Friday, July 6th at 7pm at the small boat launch at the Plattsburgh City Marina at Dock Street. The event was the brain child of Rich Jarrette, who was just recently named a 2018 Rotarian of the year. 30-plus boats were part of history as we came together for our first attempt to create a chain or link of non-motorized boats from the Plattsburgh City Marina to Wilcox Dock. Unfortunately, unusually strong winds made it impossible to link boats for a sustained period of time but the boaters had wonderful time enjoying the lake and the festive atmosphere. Thank you to Eagle Country for providing music at the marina!